Those raspberry filled krispy kreme donuts tho. Zeppola is the star of the show, it provides the sweet powdered sugary donut base, with some support from Torrone and Meringue. From FA Marshmallow I get the powedered confectioned outside of a marshmallow rather than the fluff inside. The power duo of FA Raspberry and TFA Raspberry Sweet have the chore of pulling together the sweet jelly raspberry inside. Cap Vanilla Cupcake is there to round out the bakery section. I really enjoy the donut base of your recipe and I do get some raspberry in it, but it's more candied than jellied. I feel like it needs a little bit more authentic raspberry and maybe some blackcurrant to make the jam a bit more juicy. I do really like it though and I'm not the too sensitive to raspberry sweet either so I need to tweak this next time I want to mix it. Thanks for your hard work! 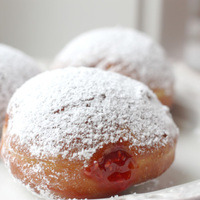 Great donut recipe, very tasty.